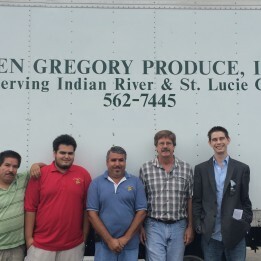 Ken Gregory Produce was founded in 1997 by Ken Gregory in Vero Beach, Florida as a business delivering Fresh Produce to wholesale customers. After seeing potential in independent grocers and restaurants, Ken started introducing the same quality and service from retail stores with the best value to the wholesale customers. Ken Gregory Produce strongly believes that their success and growth of their company is based on their quality of products, service, and most of all, loyal customers. We are a wholesale distributor and Full Service Supplier of Fresh Produce, Dairy, Frozen Specialty items, and much more. We have knowledgeable & Bilingual staff with over 50 years combined experience in the produce industry to assist you. This family owned company provides excellent service to a diversity of local Clients including Country clubs, Restaurants, Distribution Centers, Hospitals, Convalescent centers, Non-Profit Organizations, Caterers, Hotels, Churches, and Specialty stores throughout the Treasure Coast covering Indian River, St. Lucie, Brevard, Martin and surrounding Counties. © 2015 Ken Gregory Produce, INC.